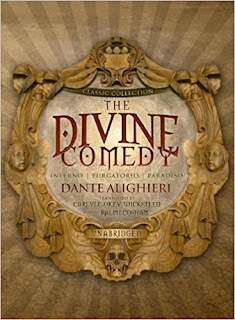 Christian Blauvelt at BBC.com offers a piece on Dante’s The Divine Comedy. That’s the inscription on the gate to Hell in one of the first English translations of The Divine Comedy, by Henry Francis Cary, in 1814. You probably know it as the less tongue-twisting “Abandon hope all ye who enter here,” which is the epigraph for Bret Easton Ellis’s American Psycho, hangs as a warning above the entrance to the Disney theme park ride Pirates of the Caribbean, appears in the videogame World of Warcraft, and has been repurposed as a lyric by The Gaslight Anthem. You may have never read a single line of The Divine Comedy, and yet you’ve been influenced by it. But it’s just one line of the 14,233 that make up The Divine Comedy, the three-part epic poem published in 1320 by Florentine bureaucrat turned visionary storyteller Dante Alighieri.